On the rare occasion that I do go to a coffee shop for some joe, I’m often tempted to pick up a crispy rice square to go along with it, but two things usually deter me. 1) The fact that shops usually charge as much as $2 per square, which seems way overpriced for something you could make at home for a fraction of that, and 2) the fact that they usually don’t taste very good after sitting in a pastry case for, hell, I don’t know, a half day? This morning, I was jonesing for some crispy rice squares to go with my morning coffee. I thought about attempting fellow blogger Foodie on the 49th’s insanely delicious-looking bacon, peanut butter and chocolate Rice Krispy treats, but I didn’t have any bacon or chocolate on hand. 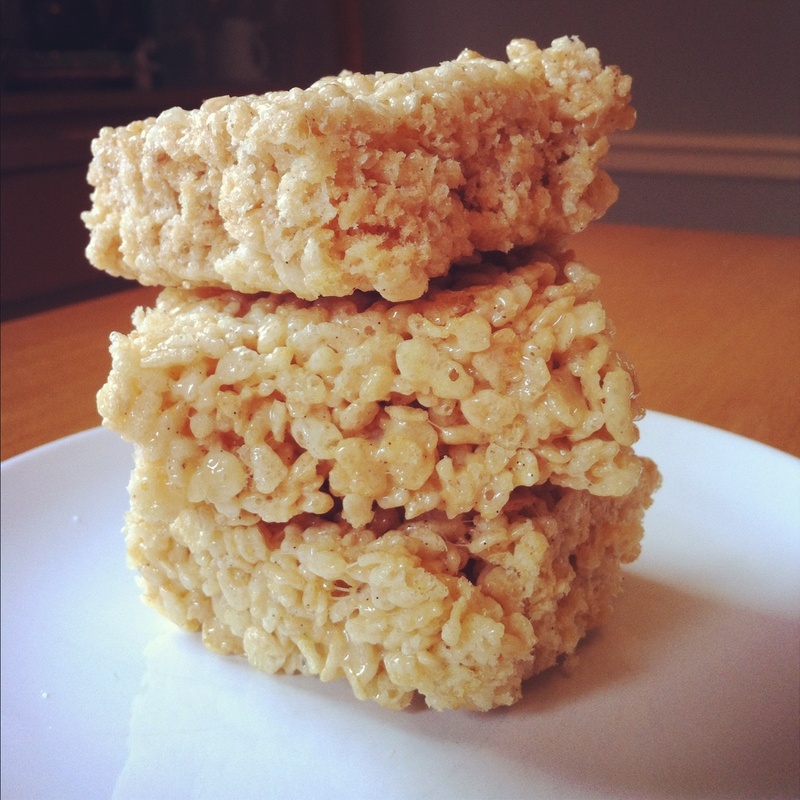 So, I turned to my trusty copy of Flour: Spectacular Recipes from Boston’s Flour Bakery, for inspiration, and found a recipe for Brown-Butter Crispy Rice treats. Brown butter? Why hadn’t I thought of that before? Yes, please! Brown butter, or beurre noisette, is that extraordinary ingredient that lends a certain je ne sais quoi to pastries and sauces. Rich and aromatic, this butter is definitely one to add to your cooking repertoire. I first discovered the wonder that is brown butter in this Epicurious recipe for Spoon Cookies, which are basically shortbread cookies, and was immediately smitten. It’s like magic–one moment, you have an ordinary stick of unsalted butter, and the next, you’ve struck culinary gold. As the pan heats up over low heat, the butter separates and the milk solids sink to the bottom of the pan and turn a lovely hazelnut color. And the smell! Oh, the smell is to die for. It’s what I would imagine inhaling nutty toffee cocaine would be like, and I think it must put my pituitary gland’s endorphin production into overdrive because I am always in the BEST mood after making a batch of beurre noisette. Anyway, I digress. On to the good stuff. I’ve adapted this recipe from the Flour recipe book, since I wanted to try a little something extra to go along with it. And yes, I could have just called them “Brown Butter Crispy Rice Squares,” but Frenchifying phrases seems to make everything sound/taste better. 1) Butter a 9 inch by 13 inch baking pan and set aside. 2) Melt the butter in a large, heavy pot over low heat. 3) Scrape the seeds from the vanilla bean pod** and mix in with the butter. 4) Keep a close eye on the butter. At first, the butter will foam up, and then the foam will disappear. A thicker layer of foam will come up and blanket the surface just as the butter solids start turning brown. You’ll smell a nutty, toffee-ish fragrance, which should signal that the butter is changing. This process takes about 6-8 minutes, depending on your stovetop burner. 5) Once the butter has browned, turn off the heat and take the pot off the burner. Immediately add the vanilla powder, kosher salt and marshmallows, and stir constantly until the marshmallows melt and you’re left with a smooth mixture flecked evenly with vanilla seeds. 6) Add the crispy rice cereal to the mix, and stir until everything is well blended. 7) Dump the contents of the pot into the prepared baking pan, and press the mixture into the pan. 8) Let cool for about an hour, cut into squares and go to town with a cup of coffee, tea or milk. **Don’t throw away the vanilla pod! Those things are expensive. Try sticking it in an airtight glass jar and cover it with granulated sugar to make vanilla sugar, which lends a lovely flavor to other baked goods. After all, want not, waste not, right?